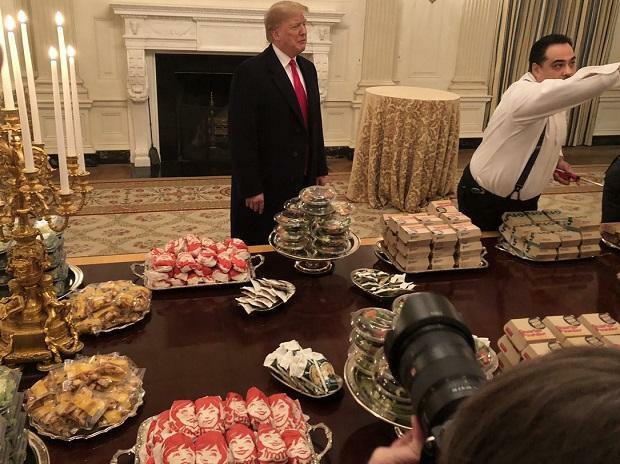 US President Donald Trump personally ordered an "all American" feast of burgers, pizza and fries for a visiting college football champions as the White House chefs are among those furloughed due to the ongoing partial government shutdown, the longest in the history. "The President wanted to host a fun event to celebrate the College Football National Champion Clemson Tigers. Because the Democrats refuse to negotiate on border security, much of the residence staff at the White House is furloughed so the President is personally paying for the event to be catered with some of everyone's favourite fast foods," White House Press Secretary Sarah Sanders said. "But I'll bet you, as much food as we have we have pizzas, we have 300 hamburgers, many, many french fries, all of our favourite foods. I want to see what's here when we leave, because I don't think it's going to be much. The reason we did this is because of the shutdown," the president explained.